By road: Li is located on Fjärås Bräcka 10 km south of Kungsbacka visible from E20. The nature reserve Fjärås Bräcka is a sand ridge from the last stage of the ice age damming the western end of Lake Lygnern. Above the burial site is a visitor center and a parking place. 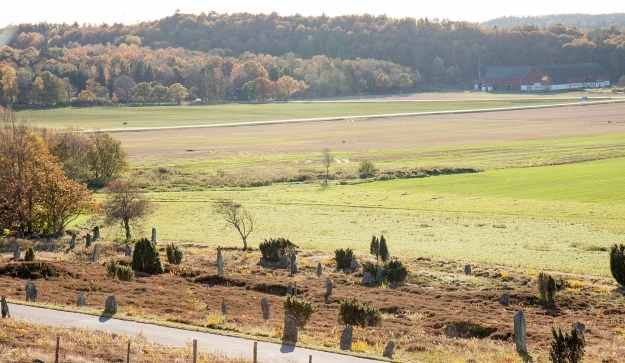 The Li burial site is one of the largest in western Sweden with their mounds, stone settings and more than 100 standing stones. Around the province are numerous mounds and stone settings on smaller impediments in the landscape and stone mounds on the surrounding heights. It shows a rich settlement during the Bronze and Iron Ages. Li is located in Fjäre district. According to a Swedish place names dictionary the name was formed by the “old Danish fiæra ‘periodically flooded beach’. People living in Fjäre, fervir, are mentioned in the Roman-Gothic historian Jordanes description of the tribes in Scandinavia from mid 500s AD. You can read more about the burial site on Bengans Historiasidor (in swedish). The burial site contains 4 mounds, 24 round stone settings, 7 oval stone settings and around 125 standing stones.